Bondsman Arnaldo Corpus testifies during a trial in a case involving former Hidalgo County Clerk Omar Guerrero's bond in the County Court-at Law No.1 at the Hidalgo County Courthouse, Monday, April 2, 2018, in Edinburg. EDINBURG — A bondsman will have to pay the county $50,000 after a jury decided Tuesday that he is liable after his client failed to appear in court. Mission-based bondsman Arnaldo Corpus posted bond for former district clerk Omar Guerrero in May 2013, and Guerrero failed to appear for his arraignment a few months later. 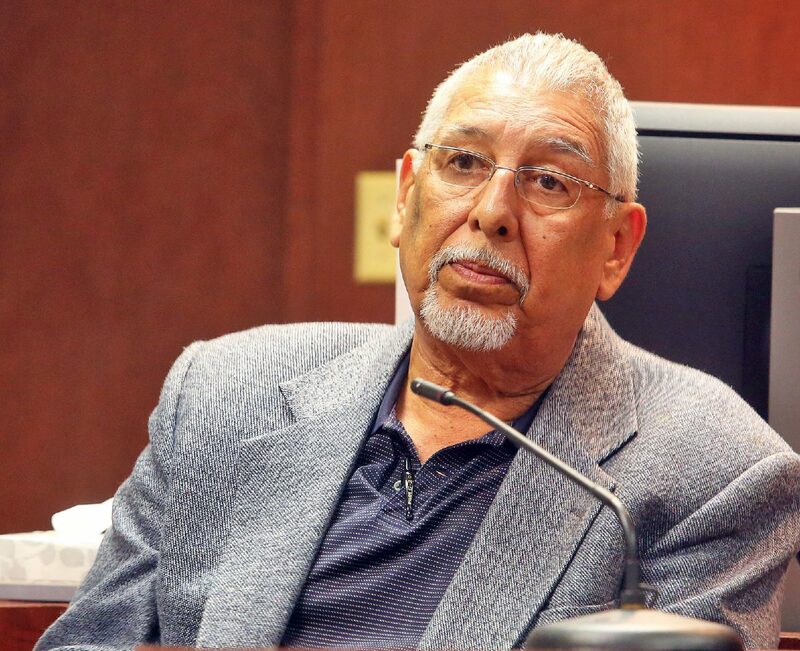 This is the first time a Hidalgo County jury heard a bond forfeiture case, and County Court-at-Law Judge Rodolfo “Rudy” Gonzalez told jurors their decision will have an impact on county bail bond companies and the Hidalgo County District Attorney’s Office. At question in the case was whether there was a valid bond, whether Guerrero failed to appear in court and whether the proper procedure was followed to initiate the bond forfeiture. Corpus’ attorney, Oscar Alvarez, argued that the judgment nisi — the filing document which initiates the forfeiture process — was invalid because County Court-at-Law No. 1’s bailiff allegedly failed to call Guerrero’s name three times at the October 2013 arraignment despite the document noting otherwise. Alvarez also pointed out various errors on the documentation, such as the misspelling of Corpus’ first name, and discrepancies as to whether Guerrero was actually served with the necessary paperwork. “The state’s paperwork, the evidence they’ve submitted, is seriously flawed,” Alvarez said during his closing arguments. Despite the spelling error, Assistant District Attorney Eric Schreiber pointed out that Corpus still managed to file an answer challenging the judgment nisi. The jury ultimately sided with the state. Schreiber maintained throughout the brief, two-day trial that by posting a bond for a man with a history of fleeing the country to avoid criminal charges, Corpus’ bail bond company had assumed the risk that Guerrero might not show. “That’s part of the business of being a bondsman: sometimes your clients show up, sometimes they don’t,” Schreiber told jurors. “That’s a risk that you undertake when you enter into that business. Once the final judgment is entered and signed by the judge within the next few days, Corpus will have 30 days to contest the jury’s ruling by filing a motion for a new trial or filing an appeal with a higher court. If he does neither, the bond will be due at the end of the 30-day period. Alvarez declined to comment after the jury’s ruling, only saying that challenging the judgment was “an option” for his client. If Corpus chooses to appeal the ruling, he will have to post a $50,000 supersedeas bond — an appellate bond — to prevent the state from enforcing the judgment during the appeal process.